bullet ramp (where the angular surface intersects the vertical) should be smoothly rounded. (6) Inspect receiver for looseness with barrel, deformation, rust and burrs. If receiver is disassembled from barrel, inspect for worn or crossed threads in barrel aperture (DEPOT MAINTENANCE ONLY). (7) Inspect bolt guideway and locking shoulders for wear, burrs, cracks, and foreign matter. Inspect receiver retaining lug on rear end (Figs. 78 and 104) for wear, burrs, and looseness with recoil plate when assembled to stock. (8) Inspect operating slide guideway on right side for wear, burrs, and foreign matter, and operating slide removal cut for wear and burrs. Inspect operating slide stop detent aperture for wear, burrs, and foreign matter. Forward surface of aperture should be at a sharp right angle to receiver, and with a clean edge to facilitate retention of stop, and rear face smooth and sloping to facilitate camming. Inspect the rear inside face of receiver for foreign matter. (1) General inspection, inspect barrel for deformation, alignment with receiver, and for rust, corrosion, and burrs. Inspect gas port for foreign matter and inspect extractor cut in rear face for burrs and foreign matter. Inspect operating slide guideways for excessive wear, burrs, and foreign matter. Burred or damaged muzzle end causes inaccuracy. Figure 76. Removing barrel from receiver. and hold barrel so that light is reflected into chamber and bore. (c) If the bore contains small pits but has sharp and uniformly distinct lands, is free from bulges, and is not otherwise deformed, it is serviceable. (d) If the barrel contains a bulge, it is unserviceable. This condition is indicated by a dark ring in the bore and may often be noticed through a bulge or raised ring on the barrel surface. (e) If the barrel is pitted to such an extent that the sharpness of the lands is affected, or if it has a pit (or pits) which extends the width of a land or groove and is three-eights inch long or longer, the barrel must be rejected. (f) During the inspection of the bore from the breech, give special attention to the chamber. Pits will cause hard extraction and may cause the cartridge case to stick in the chamber sufficiently to cause failure to extract. Barrels with chambers having pits large enough to cause cartridges to stick are unserviceable. (g) All rebuilt carbines must be coun-terbored at the muzzle end of the barrel (Fig. 79). 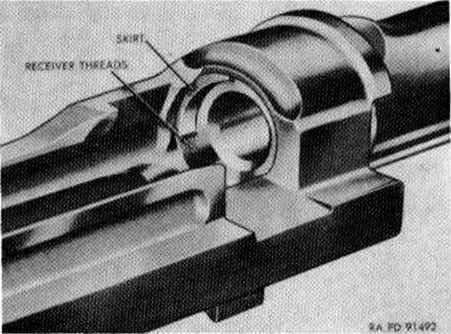 This counterbore improves the accuracy of the carbine and is intended to eliminate tool marks, nicks, and burrs in the muzzle end of the barrel. (fc) Barrels of current manufacture have been modified by the elimination of a portion of the skirt on the chamber end. In barrels of early manufacture, this skirt was extended around approximately two-thirds of the chamber end of the barrel and was thickened somewhat in its center section. As the thin section of the skirt served no useful purpose, it was eliminated and only the thickened portion remained. When looking into the breech end of the gun only the thickened portion remained. 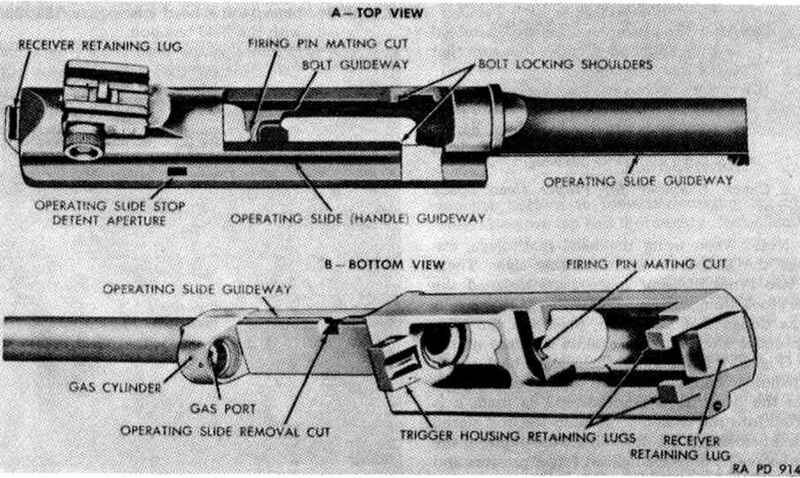 When looking into the breech end of the gun ahead of the bullet ramp, the thread of the receiver can be seen (Fig. 80). This is a normal condition. Figure 77. Removing piston nut from gas cylinder. requirements but are otherwise serviceable, should be retained in the depot maintenance shop until a sizable quantity has accumulated, whereupon disposition instructions should be requested from Chief of Ordnance, Washington 25, D.C., ATTN: ORDFM. The use of drop plug gages to check the straightness of the bore is not required. However, if the depot maintenance establishment performing the work deems it practicable, such gages as shown on drawing B7317562 are authorized for use in process inspection, local fabrication, and maintenance. 0) Check to see that the new type front band assembly (Fig. 81) is used and that the rivets are tight. Visually inspect bayonet stud on front band to assure that it is in good condition. 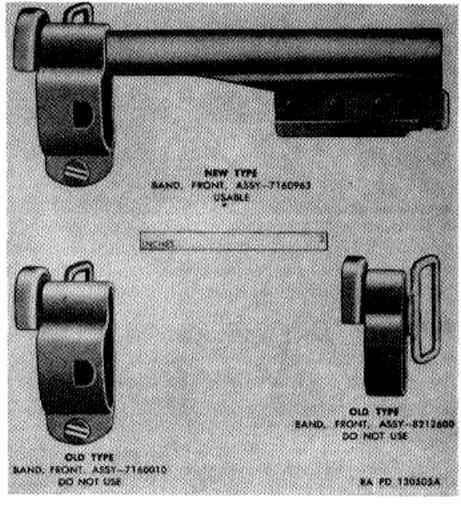 Modification Work Order ORD B28-W5 specifies that the old type front band assemblies must be replaced with the new type (Fig. 81) and describes the pro cedure. Check shape of front band swivel to assure that it swivels properly. c. Gas Cylinder Group. (1) Inspect the swaged-on type cylinder to assure that it is tightly swaged onto barrel, as determined by a hand test. Check all gas cylinders for deformation, piston wear, burrs, carbon, and rust, and check the gas port for foreign matter, using a 0.070-inch drill or plug inserted by hand. (2) Inspect piston for wear, burrs, and carbon. (3) Inspect piston nut for loose fit in gas cylinder. Inspect threads and turning lugs for wear and burrs. Inspect piston aperture for burrs. Piston should be an easy fit in aperture. Examine to determine that the gas cylinder has been staked very lightly into the nut in one place only. Figure 79. 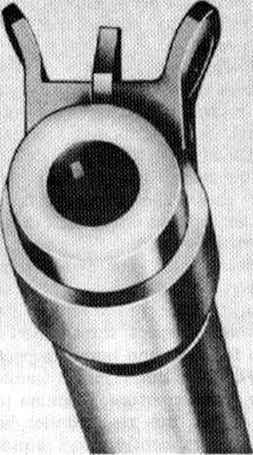 Muzzle end of barrel showing counterbore. is usable; if a carbine lacks power with the uncounterbored nut, replace with a counterbored type (Fig. 43e). (5) After the piston and nut are assembled in the gas cylinder, check to assure that there is no binding. (6) Inspect receiver for looseness with barrel, deformation, rust, and burrs. If receiver is disassembled from barrel, inspect for worn or crossed threads in barrel aperture. Note. When using the head space gage, disengage the bolt from the operating slide. There are two types of head space gages assigned the same stock numbers for same sizes. If the gage is of the design that has a rim, place the rim carefully under the extractor against the face of the bolt (Fig. 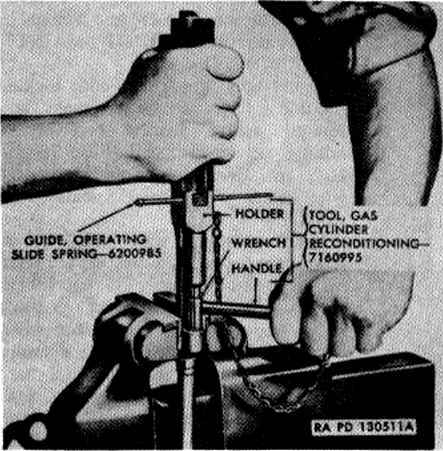 83), if the extractor is assembled, thereby avoiding snapping the extractor over the gage. When the other type (shouldered), is used, it is inserted into the chamber first and the bolt closed on it. In closing the bolt to check the depth of the chamber, exert only the lightest finger pressure and make sure that the hammer does not exert pressure against, the bolt. (1) Insert head space gage 7319934 (head space length 1.290 inches) into chamber, wide cylindrical end first, and close bolt. The bolt must close on the gage. 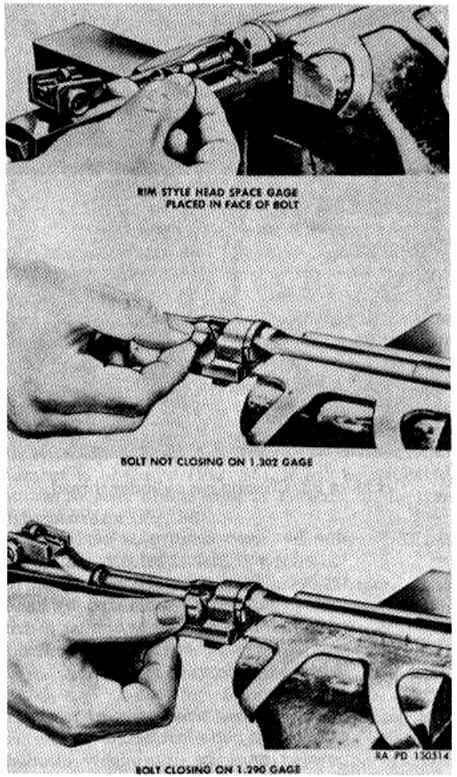 With a new barrel, the bolt may not close on the gage without being forced. This is an indication that the head space is insufficient and the chamber must be reamed. (2) Insert head space gage 7319938 (head space length 1.298 inches). If the bolt closes without perceptible bite on the gage, the carbine is not acceptable for return to stock. (3) Field test bolt 7319932 (instead of carbine bolt) must close on head space gage 7319934 (head space length 1.290 inches). This is necessary to assure interchangeability. The field test bolt is dimensioned 0.560 inch from face to locking surface. 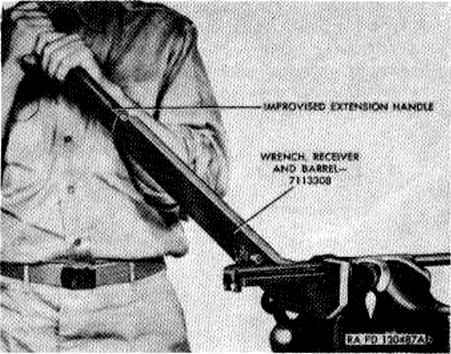 (4) When the carbine is rebarreled (DEPOT MAINTENANCE ONLY), every effort must be made to hold the head space as close as possible to 1.290 inches, using the field test bolt. Under no circumstances should head space exceed 1.295 inches on rebarreled carbines, using head space gage 7319936 with the field test bolt. (5) Carbines whose head space is less than 1.302 inches, that is, component bolt does not close on head space gage 7319943 are acceptable for domestic and overseas use (FIELD MAINTENANCE ONLY). Figure 80. Breech and barrel showing new type skirt. (1) Check to assure that barrel has been staked at rear end of front sight. (2) Check to assure that staking the front sight keyway and the application of the proofmark have not distorted the bore. (3) Check front band screw to assure that head is in good condition and that it is staked or spun over sufficiently to prevent loss of screw. (4) Check to assure that the ring portion of the front band surrounds the barrel with spring tention and check the swivel to assure that it swivels properly. (5) Check to assure that the operating slide can be drawn all the way back to its stop against the receiver without binding. How to insert white numbers on M1 carbine receiver? 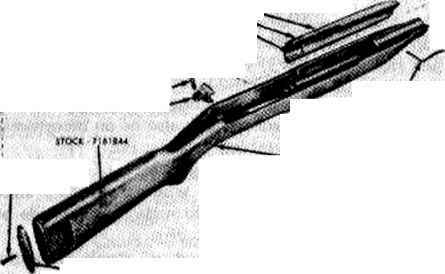 Who make the m1 carbine barrel for gunpartscorp? When buying a collectable M1 carbine should the reciever & barrel match?